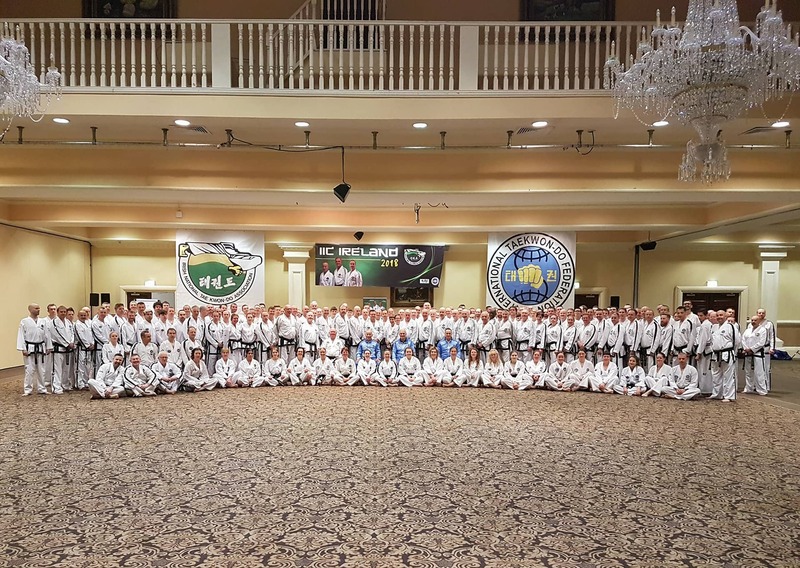 The 128th International Instructor Course, hosted by the Irish National Taekwon-Do Association (INTA) and the ITF Technical Committee, was held in Dublin, Ireland on the 12th/13th of May. The event took place in the familiar Citywest Hotel, where the 2017 World Championships were held. The IIC was conducted by the ITF Technical Committee, under Grandmaster Hector Marano, Grandmaster Kim Ung Lang and Grandmaster Pierre Laquerre. Grand Master Brendan O’Toole, president of INTA, was also in attendance and particpiated in the course. A total of 185 participants attended the event, which included 20 GrandMasters/Masters, 80 Sabum and 80 Boosabum. The first day of the seminar saw the group train together and consider the practical application of movements, self-defense and step sparring. On Saturday evening 91 participants attended the banquet and had an opportunity to chat with old friends and meet with new ones. Sunday morning started with the test for new promotions. The grading saw two participants progress to 6th Degree and two new Masters! Congratulations to all. After the grading, the IIC commenced with two groups, 3rd Degree and below and 4th Degrees and above. Participants went through patterns and stretching and had the opportunity to ask questions and clarify queries and gain some helpful information to assist in training and teaching. During the closing ceremony, the Technical Committee were presented with three pieces of Irish Art by Master Gerry Martin from the INTA. The metal pictures in Celtic design were entitled ‘ Friendship’ and tell the story of how every meeting of a new or old friend is not by chance and that every meeting has the opportunity to enhance our lives. After the presenting of the gifts, Grand Master O’Toole thanked the ITF Technical Committee for a very informative weekend and to all the participants for making it a successful and enjoyable weekend.